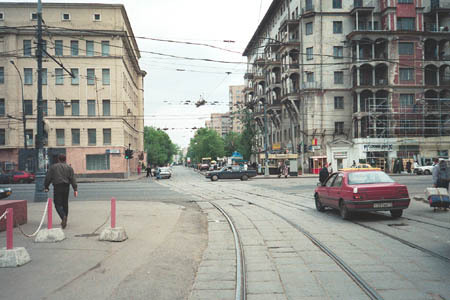 A tramline crosses Prospekt Mira highway beside a Metro station of the same name. 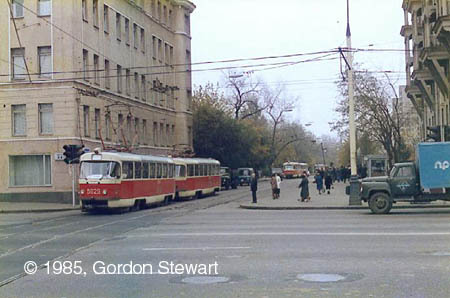 The line was constructed in the middle of 1930's, when tramlines began to disappear from Sadovoye Koltso. 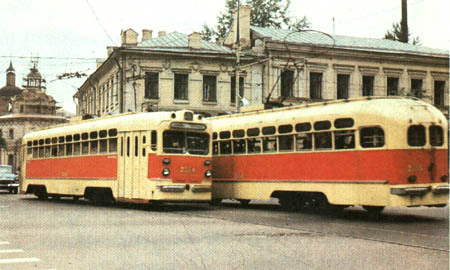 There were many tramlines constructed in parallel lazy streets as replacement ones in that time - tram was the primary way of transportation in Moscow, and no line could be closed without construction of another one. I have scanned this photo from a German magazine Modelleisenbahner #11-1987. 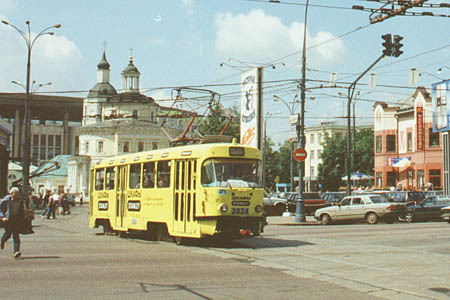 This is a depiction of once widely used in Moscow tramcars - model MTV-82. It was not difficult for me to recognize the crossroad I knew well when I was a child. The same crossroad of prospekt Mira 25 years later. The tramline is still alive! A church in the distance has been reconstructed. A two-storey building in the corner is long gone - it was demolished in 1980 to construct a broad esplanade in front of the Olympic stadium. And this is a view of the same crossroad from another side of the road. A two-storey building was in the place where red poles stand; and lo! the track still curves around that place! Another view of the same crossing a dozen years before. It is hard to believe how empty streets have been not so long ago where today thousands of cars struggle to make their way. When walking along Prospekt Mira, one can see a rather interesting building with unusual design. 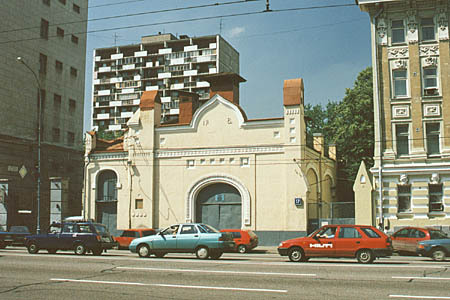 This was a tram electric substation #8 (the number still can be seen on the front); its operation was begun in 1911 and it continues working as electric power supply for trolleybuses (no trams are near it now) in our days.